Mix in a bowl with a fork the mince, tomato paste, mustard, chopped basil leaves, salt and pepper. Grate half the cheese. Place in the middle of half of the dough circles a spoon of the mince mixture, and in the other half put a spoonful of the grated cheese. Fold each circle in half, then bring the two points together to form petals. 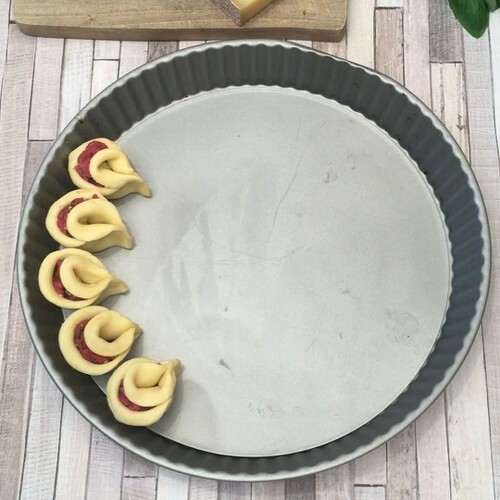 Arrange the petals in the tart tin, alternating between met and cheese rings, to form one large flower. Add a small cube of cheese to the hollows between the dough petals. Brush the dough petals with a little milk, then bake for 45 minutes at 180°C. Enjoy.